*Although BRYAN and DELAINE RICHARDSON have the same friends, attend the same school, have the same last name, share similar looks and travel in the same circles, they don’t know each other. Following the constant prodding of friends and strangers who continually mistake one for the other, or speak of how much they look alike, they meet. Instant friendship leads them to a path of discovery where they find that they share much more than their looks, surname, likes and dislikes, and the abandonment of a father. *On a brutal New York winter’s day, Delaine is accidentally locked out of her house and is forced to go to Bryan’s house for shelter. In the living room, Delaine observes a wall of photos that reveal what they truly have in common – a father. Suddenly a whirlwind of friendship and sisterhood bring them even closer together to form an unbreakable bond as they embark on a journey through life. *Exceeding the limitations placed on them as children reared in single parenthood the sisters blossom. Bryan a top-notch health administrator with a promising career but horrid love life and Delaine, an anxious underemployed public relations guru at the end of her rope, receive an invitation to a celebrity studded party. Attending this party will ultimately fulfill each of their individual desires. Delaine, a sizzling career and Bryan, the love affair of a lifetime. The source of their good fortune is one man, MAXIMILAN R. BRIGGS III, a handsome, young entertainment mogul with a heart of gold. Enabling Delaine’s dream of a dynamic career and capturing the heart of Bryan encompass Max within the Richardson sisters’ circle. 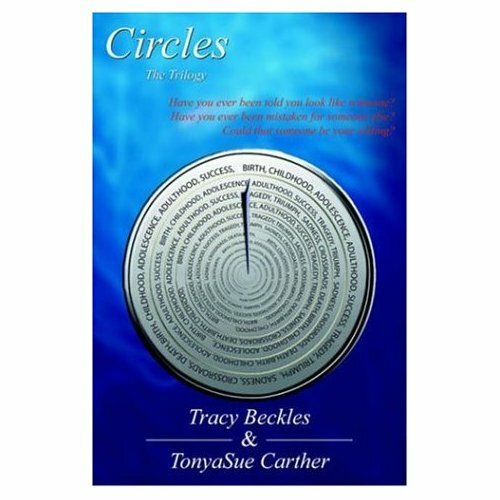 Tracy Beckles was born in New York City, where she currently writes and resides with her two children and mother. Her relationship with pen and paper became permanent after she enrolled in a creative writing class in high school, where she met her literary partner, TonyaSue Carther. TonyaSue Carther is the Associate Editor of Black Noir, Toy Box and Rap It Up Magazine and doubles as a romance, book, movie, dvd review specialist. She is currently shopping around screenplays throughout the entertainment industry. A native New Yorker who hails from the Bronx, Ms. Carther currently resides in New Jersey, where she pursues a career in film. Circles is one of the most suprising books that I ever read. The premise gets better with every chapter! Beckles and Carther brilliantly focus their story on the warmth and complexity of human relationships, especially between two sisters who share one father. Throughout the book, they create a certain spirit that cannot be denied. The dialogue is at times hard to follow but always amusing. You will be mesmerized through the end. This is a recommended read!! I related very much to the plot in Circles because I identify with this situation. It sure happened in my family. The title is appropriate because the dialogue went in cicles at times but this is the situation for a lot of families all over. The ending was not shocking to me because growing up in the caribbean, events like that happened often enough. But it will be interesting to see what happens next. Look forward to it. I am an avid reader of fiction and I must say that Circles is a mainstream as one can get. The relationship between the sisters moved me to tears. I don’t believe that the subject of infidelity has been approached in such grand fashion. The dialogue was a little confusing but the authors’ style is pleasantly unique. I have great expectation for the next installment. Hats off to Beckles and Carther nice shot for a debut.